Learning to do so will pay off big time. It is arguably the single best way to improve your playing, and is an essential piece in the development of musical fluency. In the second installment, I provided some ways to get started developing your ear, if this is something that’s totally new to you. Inside of the Breakthrough Banjo course, I’ve also recently added the Ear Laboratory, an extension of the “Learning to Play by Ear” modules. The laboratory will include video tutorials where we’ll take a song and go through the process, step by step, of transforming it, by ear, into a banjo arrangement. The ultimate goal being to break down what oftentimes seems like an overwhelming process into a series of manageable steps that anyone can learn, with a bit of practice. 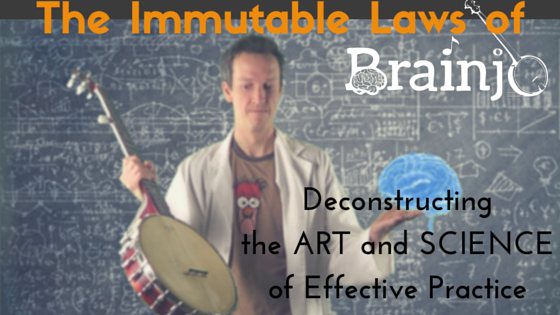 So, to help crystallize the concepts we’ve covered in parts 1 and 2 of this “playing by ear” series in the Laws of Brainjo, here is the first episode, where we’ll create an arrangement of Pretty Polly, from scratch. Also, do you offer a similar course for finger picking (Scruggs style)? Or do you know of any good courses for this. Do you have a learning to play by ear for finger picking style?